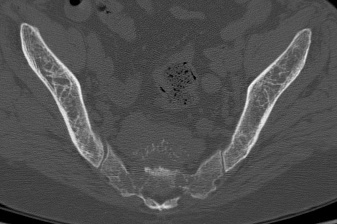 Coronal and axial CT images of the pelvis demonstrate diffuse heterogeneity of the osseous structures. 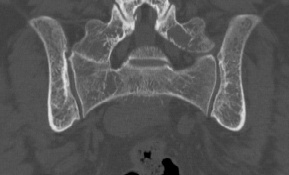 Soft tissue mass positioned anterior to the sacrum represents extramedullary hematopoetic bone marrow. Differential diagnosis for heterogeous appearance of the bone marrow is broad and includes infectious, neoplastic, hematogeous disorders and iatrogenic causes.